We offer a variety of half-day and full-day summer camps for ages 6 and up. Each camp day is filled with climbing, learning, adventure, goal setting, games, and tons of adventure-filled memories! 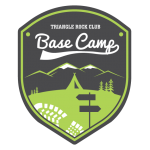 View all camp options at Triangle Rock Club, or filter by age range below. New climbers will learn the basics of the sport and more experienced climbers will conquer new challenges while they work to improve their climbing abilities. Our knowledgeable staff members spend time with campers climbing, playing group and teambuilding games and teaching basic climbing safety skills. Weekly activities include top rope climbing, bouldering, tag traverse, blindfolded climbing, and more. Camp fee includes harness, supervision, and tons of excitement and adventure! Early Care: $6/day. After Care: $6/day. Early Care is 30 minutes before each session, and After Care extends is 30 minutes after each session. Our Full-Day Climbing Camp is perfect for climbers looking for a full week of climbing, adventure and fun! Campers enjoy mornings full of activity with climbing, group games, team building, goal setting and more. After lunch, it’s time for climbing instruction where campers learn skills and techniques that make great climbers, and then even more climbing! In the afternoons is “Beyond the Climb” – a segment of the day where campers participate in an educational activity or game related to a rotating weekly theme. 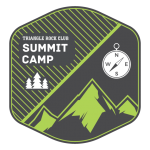 Summit Camp gives older climbers the chance to set and reach goals while developing their skills as climbers. Whether new to the sport or climbing for while, this new camp will challenge your child and provide fun, exciting opportunities for growth each day! Siblings who are registered for the same week and camp receive $25 discount. Members receive an additional $25 discount. Get ready for our full day, high-adventure Expedition Camp for teens, created to strengthen older climber’s abilities through days packed full of adventuring. 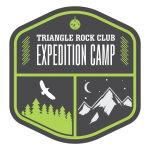 Expedition Camp includes trips throughout the week, including an afternoon of kayaking, a high-ropes team building course, a visit to another Triangle Rock Club location, and one day of guided outdoor climbing at the end of the week! 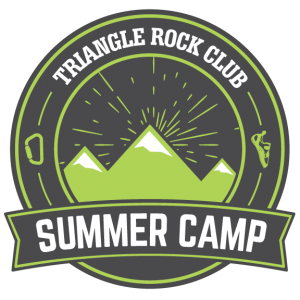 Our Full-Day Summer Camp is perfect for climbers looking for a full week of climbing, adventure and fun! Campers enjoy mornings full of activity with climbing, group games, team building, goal setting and more. After lunch, it’s time for climbing instruction where campers learn skills and techniques that make great climbers, and then even more climbing! In the afternoons is “Beyond the Climb” – a segment of the day where campers participate in an educational activity or game related to a rotating weekly theme.